"The course is astounding. Rarely have I seen a golf course that offers such a wide range of options on every shot, and, in particular, never outside the UK have I seen a course that is so attuned to the running approach." Golf Architecture a Worldwide Perspective Volume V: Why does the golf course industry segment courses in a way different from the way that people who play golf enjoy the game and its grounds? 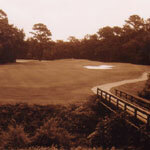 Why are there such differences between what the magazine rankings and also what players consider to be the greatest course? I answer these questions in the essay that can be read by clicking the link to the right or above. Golf Architecture a Worldwide Perspective Volume IV: The process of routing a golf course is 'akin to running a marathon minus the map leading you to the finish line'. Enjoy the rest of the article by clicking the image to the right. Native American Casino, Aug, 2008, Notes on the routing of a golf course. Turfnet: The Newslettert, Oct/Nov, 2007, features articles on current trends in the industry. My utilization of GPS technology is featured throught the story, from design through construction. 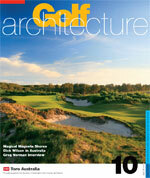 Golf Architecture: Journal of the Society of Australian Golf Course Architects, Issue 10, 2007, features articles on current trends in the industry and historical perspectives of past great works. The article describes the unique nature of my project on the Gulf Coast of Texas. 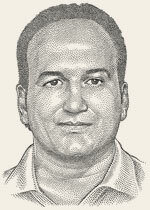 Native American Casino, Aug, 2007, Notes on economical design, construction and maintenance. Golf Architecture: Journal of the Society of Australian Golf Course Architects, Issue 9, 2006, features articles on current trends in the industry and historical perspectives of past great works. The article describes two primary methods for creating plans and analyzes my method that combines both as an efficient solution. Golf Architecture: A Worldwide Perspective, Volume Three, incorporates forty-seven absorbing golf-architecture-based essays by leading golf architects and knowledgeable golf writers, supported by in excess of 350 images from notable photographers and artists. 1/2 page ad on page A3 of the Wall Street Journal. Black Mesa Golf Club images published in 7 national publications. Golfweek, Golf Magazine, T&L Golf, The Golfer, Links Magazine, Celebrated Living, Golf Monthly and many regional publications.